How Is Sucrose Different Than Sucralose? Kirstin Hendrickson is a writer, teacher, coach, athlete and author of the textbook "Chemistry In The World." She's been teaching and writing about health, wellness and nutrition for more than 10 years. She has a Bachelor of Science in zoology, a Bachelor of Science in psychology, a Master of Science in chemistry and a doctoral degree in bioorganic chemistry. What Are the Functions of Digestive Enzymes? Sucrose is the chemical name for table sugar. Sucralose, though its name is very similar to that of sucrose, is a different molecule. The human body cannot digest sucralose, so it doesn't contain any calories. Due to its sweet flavor, however, it sweetens food and is often used as a sugar substitute. Sucralose is a non-nutritive sweetener, meaning that it has a sweet taste, but contains no calories. Sucrose, on the other hand, is table sugar. It both tastes sweet and contains calories, meaning that it can provide energy to the cells. Like sucrose, sucralose maintains its sweet taste in liquid, at different pH levels and if exposed to heat. As such, it's possible to use sucralose in hot or cold beverages and in baked goods, just like sucrose. Sucrose consists of two small sugar rings, a glucose ring and a fructose ring, chemically bonded together, explain Drs. Reginald Garrett and Charles Grisham in their book "Biochemistry." Sucralose, however, consists of a galactose ring and a fructose ring, bonded together. Galactose is a small sugar, like glucose, but has a different physical structure than that of glucose. Sucrose consists only of the atoms carbon, hydrogen, and oxygen. Its chemical formula is C12H22O11, explain Drs. Mary Campbell and Shawn Farrell in their book "Biochemistry." Sucralose has some of the oxygen and hydrogen atoms that would be present in a normal sugar replaced with chlorine atoms, giving it the chemical formula C22H19Cl3O8. The chlorine atoms change the biochemical properties of the sugar, and affect human digestive processes. 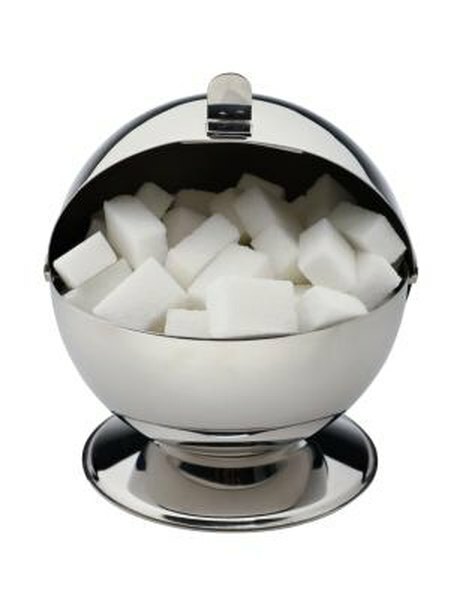 For you to absorb a sugar and benefit from the calories contained in the sugar, your body must first separate the sugar rings from one another. When you consume sucrose, the enzyme sucrase separates glucose from fructose and your intestines absorb the small sugar rings. When you consume sucralose, you are not able to separate the galactose from the fructose ring, because you don't have the enzyme necessary to break that bond. As a result, you cannot digest or absorb sucralose. Because there's no way for the human body to digest sucralose or absorb its sugar rings, it's impossible to extract any nutrition or caloric content from the sugar. Humans extract calories from nutrient molecules at the cellular level, explains Dr. Lauralee Sherwood in her book "Human Physiology." As such, simply taking a food into the digestive tract isn't sufficient to extract calories. Functionally, therefore, sucrose provides energy, while sucralose does not. Biochemistry; Reginald Garrett, Ph.D. and Charles Grisham, Ph.D.
Biochemistry; Mary Campbell, Ph.D. and Shawn Farrell, Ph.D.
Human Physiology; Lauralee Sherwood, Ph.D.
What Are Complex & Simple Sugars? Is Cranberry Juice Acidic or Alkaline?